Jason Momoa describes his take on the Batman character in his audition for Zack Snyder. Momoa was trying out to play the Caped Crusader in Snyder's Batman v Superman: Dawn of Justice, but he ultimately did not get the part. Instead, it went to Ben Affleck who has played the character three times in the DCEU. He's still technically attached to play Bruce Wayne again in Matt Reeves' The Batman, but there have been numerous rumors over the last year that he has left the role behind. In a new interview, Jason Momoa talked about trying out for Batman v Superman and how different his take on the character would have been. After seeing Momoa's approach to Aquaman, his take on the Caped Crusader makes sense. Momoa had this to say about trying out for the role of Batman in front of Zack Snyder. "Yeah I kind of visualized, because it was a generic kind of just general scene from the Christian Bale movie The Dark Knight and I just, it was a big casting call so I knew a lot of people were going to be doing it and I just felt like it was a booby trap and I just didn't want to do it. So, we did it and I just pretended like Batman got killed in an alleyway and I picked it up and tried to play him like I was just down and out, poor, over it, just done wrong and he wasn't afraid to punch even good people in the face. And just go like unforgivable about certain things but also like flawed, like the kind of person who would jump off a cliff and figure out on the way down what we're going to do." It sounds like Jason Momoa knew from the start that he wasn't going to get the Batman role. With that being said, it's really cool to know that he took a different approach to the character than what had been laid out for him, which is more than likely why Zack Snyder wanted to work with him. Momoa ends up having the perfect attitude to play Arthur Curry, which is something that Snyder found early on. Momoa explains. "So, they liked that and then I got called in about probably two to three weeks later and that's when Zack laid it down and said I want you to play Aquaman, which was completely like Excuse me?" Jason Momoa and Aquaman director James Wan have gone out of their way to smash preconceived ideas about Arthur Curry. Throughout the years, Curry hasn't been seen as the coolest of the superheroes and often gets made fun of, which was still prevalent in Justice League, a factor that Momoa was not very happy with. However, Wan and Momoa have reportedly met their goal, according to the early reactions to the movie. Warner Bros. and DC Films are releasing Aquaman over a year after the disastrous Justice League. Many DC fans believe that the studio should have let Zack Snyder finish the movie and some of the more outspoken fans have been calling on the studio to release Snyder's original cut of Justice League, which may or may not even exist. 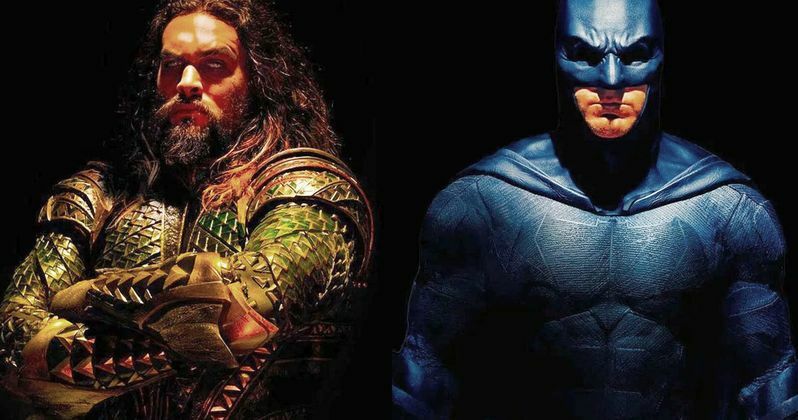 Whatever the case may be, Jason Momoa is ready to bring Aquaman out and into the world after several delays and the fans are ready to see what his Arthur Curry character can do on his own. You can watch the entire interview with Momoa below, thanks to Jake Hamilton's YouTube channel.